Vocations: That many young people may hear the call of Christ and follow him in the priesthood and religious life. Thank you for praying together as one body, the Body of Christ. P.s. I’ll fill you in on what’s happening, just as soon as I get a gap. Watching God work wonderfully! General Intention: Recognition of the Contribution of Women. Missionary Intention: Perseverance / Faithfulness of Persecuted Christians. That the Holy Spirit may grant perseverance to those who suffer discrimination, persecution, or death for the name of Christ, particularly in Asia. That the Lord may sustain the efforts of health workers assisting the sick and elderly in the world’s poorest regions. For Victims of Natural Disasters. I’m going to spend some time, meditating on these, the Holy Father has a deep spirituality, & we can fly to great heights when we follow his lead. We so often miss the need for spiritual comfort in peoples lives, perhaps because so many seem not to need spiritual comfort, suffering from a type of spiritual anorexia. If we lack with meeting material comfort needed to rebuild lives, where are we with spiritual? 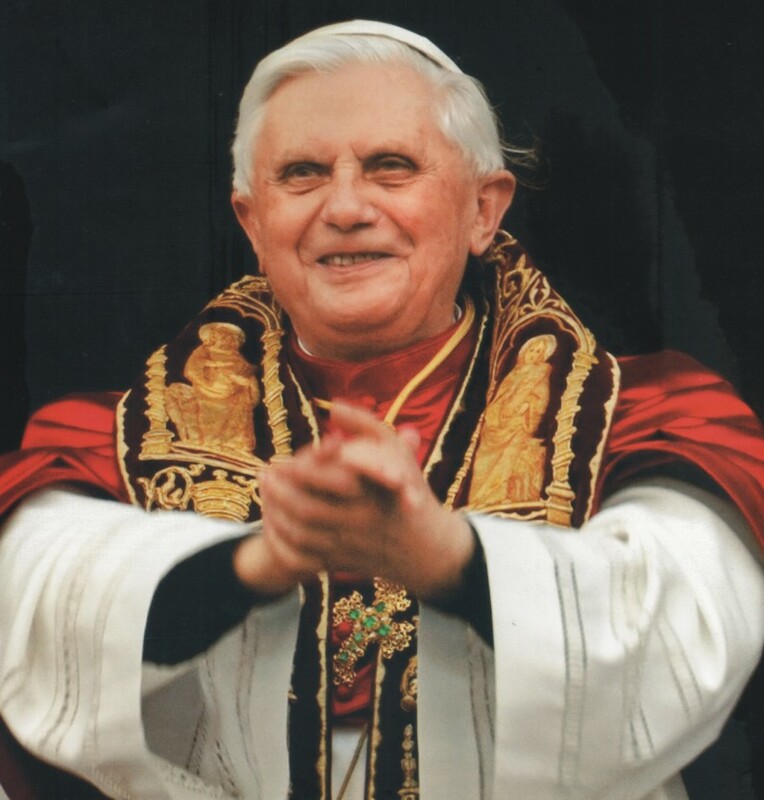 Interesting, in his Mission Intention, BXVI mentions ‘men & women of good will‘. Hmmm, just like the angels declared to the shepherds proclaiming Jesus birth… “peace to men of good will”. This is thought provoking, people who do not have good will towards someone, anyone, will not have true peace, why? Good will towards all man is essential to peace within. We need to let go of all animosity, & pray for good will towards everyone. Unforgiveness is spiritual cholesterol, blocking relationship, both with God & others. Man cannot be in a state of grace & have unforgiveness in his heart / lack good will towards another. We need to be set free! Free to Love properly, purely, wholeheartedly. Come Holy Spirit! We pray everyday, the Our Father, as Jesus taught us to pray, asking forgiveness of our sins conditional to our forgiveness of others… it’s a pretzel grip! We can’t get out of it without letting go of every debt/ grudge we are judging & condemning another of. “That the dedication of Christians to peace… may bear witness to the of the name of Christ… to men & women of good will.” Those who do not have good will, cannot see Christ, because their hearts are hard towards man, Truth, Justice & indeed, God Himself. Their intentions are not pure, an agenda is at play. Come Lord Jesus & strip us of all that is not You. We want to bear witness to Your Name. We forgive all sins against us, in Your Precious Name. Amen! We’re going to start giving the Monthly Prayer Intentions of the Holy Father, each month here on New Evangelization Mission- God Blog. Remember I spoke about Plenary Indulgences in Holiness Made Easy: How to become the spotless bride …? Well, now we’ll be giving you the Papa’s prayer intentions for each month to make this easier, since praying for his intentions is important, so we are spiritually united, as a family, the family of God. That all peoples may grow in harmony & peace through mutual understanding & respect. That children & young people may be messengers of the Gospel & that they may be respected & preserved from all violence & exploitation. Is it Love, is it Love, is it Love, is it Love that I’m feeling? Is Love a fancy or a feeling? What is Love? Do we know how to recognize it? Why is it that in some people’s presence – or for a long while after, you feel bruised, flat, squashed, as though you have nothing of value to offer or give. Like “What rock have you squirmed out from under?” Less human, treated with contempt, somehow the unspoken message rings loud & clear, you will always be inferior in their eyes, nothing you ever do is good enough. Sound familiar? I’ve just crossed paths with one such as this. Don’t keep falling for it. Whenever you start feeling small, I tell myself -stand with your shoulders high. You were created for Love. Believe. Some people make you soar, like a kite in full flight. They have a way of making you realize your full potential, you feel treasured, loved & of great worth – even when you didn’t do a thing. Lovers in the truest sense. They love you because… they do… & the person sitting next to you & the next & the next. They see a crowd as symphony of individuals – well, just because they are. These souls are secure enough to radically love in a way that utterly transforms those around them. They are not afraid of your gifts & talents, or of anyone else shinning. They give Love because they are first open to receive, nurturing it deep within & giving birth to new possibilities of life & wonders of being. The souls of these Lovers are in union with God. They live with passion, these pro-lifers; they live in God & God lives in them. True Love has a purity to it, in fact only true love is pure. Those who are pure of heart, pure in their intentions towards others, are our real lovers. They are not interested in gaining anything at your expense. They are interested in YOUR good. These people KNOW that their good, is dependent on your good. This is truth. ~ Sheer Heaven! Real purity is a state of the heart. What use is it if someone is physically pure, but polluted in thought? Only the pure of heart can see God. Only the pure of heart can truly love. Let us bring Heaven to earth & earth to Heaven! I want o share over the next while, some of the things we do to evangelize are really simple but effective. Ricky & I love to have great Catholic resource on hand to share with others. Here in Africa, one needs a Dish for EWTN & in South Africa, it’s only available via Satellite. As a consequence, few Catholics know their faith. Surprisingly enough even the Head Catechist with 17 years in this leadership role, in my sisters parish, had no clue that skipping Mass on Sundays was a mortal sin. To get people into the Bible, into the Faith & introduced to Jesus the Eternal Word Made Flesh, we have to give tasty bits of really good material, to spurn them on to growing in their relationship with God – the only way to True Life. Having cool resources in our back pocket makes evangelizing easy, it takes a love of ones faith a longing to share. The Great Adventure is a big bonus. Having the Scriptures come to life & finding your story in HIStory- thank You God! These evenings, in south Africa, were loads of fun. Oodles of delicious filter coffee on the tea trolley, fresh & hot in flasks; an urn of piping hot water for tea lovers & of course, hot chocolate. A bring & share of yummy eats, would be on the table. Dvd’s were projected onto a large screen, so visibility was perfect no matter the number & we’d settle in for a event of good laughs & faith sharing. We tried to make everything beautiful, homely & relaxing, so that all felt we’d had a special treat. This was wonderful for the community, the teens would always be there in number, thanks to Fr. Gerald, who’d have traveled far & near to collect the bunch, form the townships & all over. They’d bring their latest ipods & phones to impress us with, & really engaged the topic of the day, asking well thought out questions. The teens also added sparkle with their cute characters & cheeky quips. Light hearted & life giving, we grew in friendship & faith. I bless God for my awesome husband who shares my dreams & crazy schemes, a deep love of God & all things Catholic. However, the more I read my Bible, the more disconnected I was becoming with other Christians, yet more connected I was becoming with God. Intellectualism and reason is discouraged in non-Catholic Christianity (something I never understood) and the more I was seeking to learn the more discouraged I was becoming. My desire to deep theological training led me to Bible School, but I decided not to attend any because they all had used-car salesman pressure tactics to get me to enroll and they wouldn’t answer questions I had about theology, or help with any direction to find what it is I need to be doing for God. I just kept reading and reading the Bible. I’ve read it cover to cover many times (I stopped counting at 8) and I began to realize that I had so much willy-nilly doctrines that I had been told from various different places. And the more I studied the Bible, the less I was seeing the truth of God in the Christian Culture. I kept coming to my own conclusions about scripture that wasn’t lining up with what I was taught, yet I was still concerned that maybe I was getting something wrong with my interpretations. All I wanted was a single voice to guide me, and I could not find it. So I was curious why the Culture was so different than what I was experiencing when reading Paul, John, James, and Peter’s letters. I began researching 1st century Christianity and discovered the Didache. I was amazed at how simple and straight forward it is. I went back to the origins of the Pentecostal movement, and was amazed to find that it was less than a hundred years old! I started researching the early Protestant theologians, particularly Luther and Calvin, and it was easy to see that they were false teachers. Wait a minute! If these guys were coming up with wacky doctrines, how is it that so many people follow them, considering all you have to do is read the Bible and see they were wrong! It doesn’t take a scholar, either, not divine revelation. Just a basic understanding of Scripture shows it! So I looked into Catholicism, something I realized that I knew nothing about. All I had was a culture of anti-Catholic behavior that I was raised with. It was easy to see that the criticisms of Catholic beliefs are so off-base that it’s downright comical. I was also amazed at how reasonable the Catholic Faith is! And I could see that many interpretations of my own that I got from the Bible lined up with Catholic beliefs perfectly! So I read the Catechism, studied the Sacraments, studied the Mass, and it’s all Biblically based! All the while the Holy Spirit was leading me. My eyes opened and realized that countless different contradictory denominations that can’t even agree on simple Gospel couldn’t be right, and a Church that was still standing after two thousand years with the same unchanged belief couldn’t be wrong! So I started going to Mass and I fell in love. I wept the first time I saw the Eucharist presented and heard the bell, even though I could not yet partake. I joined the RCIA, but I’ve already learned most of what they are teaching (plus I already have Biblical knowledge from my life as an active Christian.) I just need to learn terminology, and there’s a few things here and there that I haven’t quite come to full understanding and belief yet. So here I am with a heart for God and a head like a sponge. spirituality, but I realized that what they call spirituality is really just manufactured surface emotion, and real spirituality is so much deeper than that. Anyone can feel warm and fuzzy listening to positive music and hearing encouraging words, but it’s just emotion (not that positive emotions are a bad thing, because the aren’t.) However, one can encounter the same experiential feelings at a secular concert or watching a good movie with a large crowd. It’s no different than what you feel listening to praise music or a motivational sermon in a packed church. Charismatic worship services are entertainment. Basically, they’re all about pleasing man, and not at all about pleasing God. (Of course, anybody in those services who really do have a heart for God are pleasing Him, but it’s about their own heart, and not about the music.) When the word ‘worship’ is used in the Bible, it involves someone on their knees or flat on their face, completely surrendered to God. Worship is NOT pogo dancing, no matter how fun it is. I struggled with that for a very long time, and I even thought something was wrong with me, and I thought I was horrible because I just couldn’t express myself to God in that way, no matter how hard I tried. It really grieved me, especially when others would say I was being prideful for not waving my arms in the air and having a good time. It wasn’t that at all, though! And I’m a musician with a creative mind, so it’s not like I’m some fuddy-duddy who’s scoffing at the kids. But going to mass made me see than church isn’t about me, church is about God. God says multiple times to love Him with all your heart, all your MIND, all your strength and all your soul. Our hearts let us love Him. Our minds let us meditate on Him and praise Him with our tongues, our strength lets us serve Him, and our soul connects us to Him. If you take one or more of those out of the equation you’ll never fully experience Him! Thank you for everyone who read that long note! Welcome Home Brandt! Thanks for sharing your story of conversion into the Catholic Church, this big Home of brothers & sisters from all walks of life. It’s good to have you. The New Evangelization, “new in its ardor, methods and expression”, was so close to the heart of John Paul II, has found a home in my heart. We are all included in this great work of God, as laborers in the Lord’s Heavenly Harvest, “Missionary activity is a matter for all Christians, for all dioceses, and parishes, Church institutions and associations.” J.P. II. At all times, I wish to be found at my Fathers business. Thus quenching this thirst for souls my Beloved is thirsting for. It involves drawing close to Christ, leaning upon His Breast. Learning to Image Him by growing in holiness & doing the Father’s Will. Many people have lost their faith, their hearts have grown cold. Some need to be re-evangelized, & others evangelized, since their families never managed to pass on a vibrant faith that gives life, they never had faith that bore fruit. Faith needs to be LIVED, renewed, enlivened, fanned into flame. This needs Catechesis, teaching & living testimony of others who are Alive in Christ, who are Renewed by the Holy Spirit, Transformed by The Good News of Jesus Christ & unable to hold back the life that is within them. A Life of Witness. As Jesus taught us, “...come follow me.” We cannot give what we do not have … we must be in a radiant relationship with Jesus, in order to give life. Or watch our work be burnt up. The world overflows with bad news, if the Good News is not presented with authenticity, as GOOD NEWS … nobody will want it. Good News brings Life, Freedom, Love, Joy & a New Spirit. If we proclaim the Gospel without Joy … the Message falls flat. Oh Cause of Our Joy, come to our aid, that we may carry Jesus our Ultimate Joy to all nations as You carried the Christ Child. have not been effectively incorporated into life in Christ. to the Lord Jesus Christ and the Gospel. As adolescents and adults many drift away from the Church. What the world needs now, is a clear proclamation of Jesus Christ! The world needs to be inspired, encouraged & transformed, by faith & reason, the understanding that allows our faith to soar to the Heavens. Evangelization leads to a Civilization of Love. We need to be introduced to a profound & living relationship with Jesus, built on the Rock of Peter, closely united to the Pope & the Church that Jesus founded, formed morally, socially, & spiritually. Not merely sacramentalized but evangelized. These two need to go hand in hand! The message of Jesus Christ needs to transform all aspects of life. From the courtrooms to the hospitals, to the bedroom, to Wall Street, every school & entertainment area. There must not be an area of live left that is not united to Christ, Redeemed & made new. Jesus came to make all things new. Come Holy Spirit. Happily Married. Passionately Catholic. Living with Purpose. Professional Nurse & Midwife. Nfp Teacher (Billings Method) teaching couples even on skype. Speaker at conferences, retreats, workshops & on T.V. Jo & Ricky had a pilgrimage wedding in 1995 @ Ngome Marian Shrine. Whilst they live in hope of little ones, dedicate themselves to spiritual parenthood. Jo enjoys photography, pilgrimages & spirituality. To Tithe… or not to Tithe? Verses in Hiding! … search for them. Apostle Paul … a Priest…? Holy Week & Real Life! Eat My Body: -what…? No way! …really? I Love being Catholic, why is that? Becoming Yourself: – who are you? Marriage: Heaven / Hell ? How to: Find Yourself…& survive the Ordeal ! Who said I wanted to be Silver?